2012 – a year of irony for the media industry? 1. Rupert Murdoch revives the News of the World, but online-only. 2. Nick Davies loses his job at the Guardian, but joins the revived News of the World as part of its investigative team. 3. The Guardian poaches the “fake sheikh” Mazher Mahmood from the Sunday Times. 4. A trend develops for floundering local newspapers to be bought out by local entrepreneurs, returning control and vested interest to their communities. 5. The Leveson inquiry into the culture, practice and ethics of the UK press concludes nothing needs to be done about unethical and/or illegal media practices, as they are redundant because everyone is publicly revealing everything about themselves on social media sites like Facebook anyway. 6. Journalists are officially declared to be bloggers, thereby ending a perennial (and very tedious) debate. 7. The Guardian launches a paywall. 8. Richard Desmond, founder of Northern & Shell and owner of Express Newspapers is knighted in the New Year Honour list and becomes chair of the Press Complaints Commission (PCC). 9. Wikileaks founder Julian Assange is awarded the Presidential Medal of Freedom and is appointed National Security Adviser to the Obama administration. 10. Facebook buys the Daily Mail, as part of a number of strategic acquisitions of ‘accordant’ news outlets throughout the world. 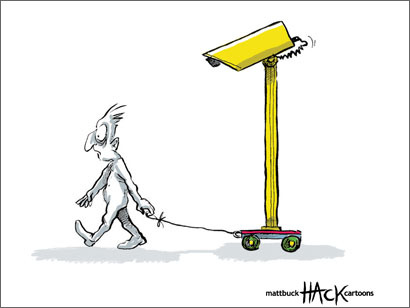 Thanks to Matt Buck for permission to use his excellent cartoon. This entry was posted in Comment, Funny, Journalism and tagged julian assange, Mazher Mahmood, News of the World, Nick Davies, Press Complaints Commission, Richard Desmond, Rupert Murdoch, The Daily Mail, The Guardian, Wikileaks on December 29, 2011 by John Thompson. The Leveson inquiry into press standards heard from key industry figures today, including representatives for the National Union of Journalists, the Guardian and the legal representative of alleged “victims” given core participant status. Michelle Stanistreet, general secretary of the NUJ spoke first, describing the Press Complaints Commission as “little more than a self-serving gentleman’s club, and not a very good one at that”. She also accused the system of having “failed, and abysmally so”. Her full statement to the inquiry has been published on the NUJ’s site here. 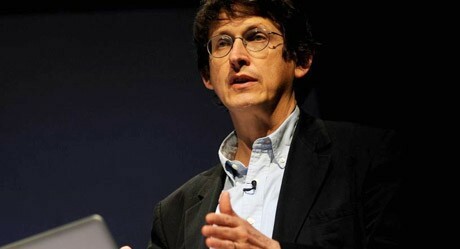 The inquiry also heard from editor-in-chief of the Guardian Alan Rusbridger, who has posted his statement in full online. We also live in a world in which every reader becomes a potential fact checker. Social media allows anyone to respond to, expose, highlight, add to, clarify or contradict what we write. We have the choice whether to pretend this world of response doesn’t exist, or to incorporate it into what we do. The more we incorporate it, the more journalism becomes, as it were, plastic. There will be less pretence that we are telling the whole truth and nothing but the truth about a story, frozen at the moment it is published – what Walter Lippman in 1922 called the confusion between “news” and “truth”. A journalist today lives with the knowledge that there will be an external reaction to much of what she or he writes within minutes of publication. Journalism today is often less a snapshot, more a moving picture. Video of today’s hearing is available to view on the Leveson inquiry website here. This entry was posted in Editors' pick, Journalism, Legal and tagged Alan Rusbridger, guardian, leveson inquiry, National Union of Journalists, Press Complaints Commission, press standards on November 16, 2011 by Rachel Bartlett. The Press Complaints Commission has responded to an article published yesterday which claimed that the body was just a mediator and not a regulator. The piece, by Brunel University’s professor of screen media and journalism Julian Petley and published on the New Left Project site, calls the PCC “merely a body which deals with complaints about the press, the equivalent of the customer services department of any large corporate organisation”. As the PCC misses no opportunity to remind us, it regards what it calls self regulation as preferable to any other kind of regulation, especially statutory regulation. As the Commission is financed by the very publications which it is supposed to be regulating, this is hardly surprising. However, the PCC cannot with justification present itself as a regulator given that (a) it was not established as a regulator and consequently (b) nothing in its Articles of Association suggest that it is meant to perform a regulatory function. Read Petley’s full article at this link. PCC director of communications Jonathan Collett responded to the piece today, rejecting the idea that the body is merely a mediator and not a regulator. Collett calls the New Left Project article a “lively read” but claims it is “undermined by being based on several false premises”. Julian Petley is obviously wrong to try to characterise the PCC as merely a mediator and not a regulator. He is wrong to suggest there is nothing in the PCC’s Articles of Association to suggest it performs a regulatory function when those articles actually specifically state that the PCC has responsibility to: “consider and pronounce on issues relating to the Code of Practice which the Commission, in its absolute discretion considers to be in the public interest”. Read Collett’s full response at this link. This entry was posted in Journalism, Newspapers and tagged jonathan collett, julian petley, new left project, PCC, Press Complaints Commission, self-regulation on August 25, 2011 by Joel Gunter. The Press Complaints Commission has published new guidance aimed at members of the public who need help coping with with media attention after the death of a friend or relative. Newspapers and magazines regularly publish stories about people who have died, particularly if the death has happened in unusual circumstances. There are generally entitled to do so, provided that they abide by the terms of the Editors’ Code of Practice. However, media interest can cause distress to those grieving, and the PCC has now issued practical guidance to ensure the interests of members of the public are properly protected. The commission says it has consulted widely on the issue, working with outlets including Facebook, the Samaritans, MPs and the police, to ensure the resulting guidance is helpful and relevant. The guidance is also said to reflect the views of newspaper and magazine industry members. See the new guidance here. This entry was posted in Editors' pick, Press freedom and ethics and tagged code of practice, death, guidance, media attention, Press Complaints Commission on June 14, 2011 by Rachel Bartlett. The Financial Times reports this morning that the chairman of the Press Complaints Commission, Lady Buscombe, has demanded individual meetings with every publisher of national newspapers in the UK, including the Financial Times itself. The face-to-face meetings are in an attempt to seek reassurance “that ethical scandals which have afflicted the industry will not be repeated”, according to the FT. This entry was posted in Editors' pick, Journalism, Press freedom and ethics and tagged ethics, newspaper, PCC, phone hacking, Press Complaints Commission, press standards on May 17, 2011 by Rachel Bartlett. Guardian editor-in-chief Alan Rusbridger, who has been and remains a vocal critic of the Press Complaints Commission, argued last night that the regulatory body should be supported and improved, not scrapped, and said the press will need to pay more to if it wants an effective regulator. Delivering the Anthony Sampson lecture at City University London, Rusbridger, who resigned from the PCC code committee in November 2009, did not let up in his customary criticism of the body, calling it “ineffective” and its 2009 report into phone-hacking at the News of the World “utterly feeble”. “How, MPs reasonably ask, can we as an industry argue that self-regulation works when it evidently failed quite spectacularly over phone hacking?”, he asked. 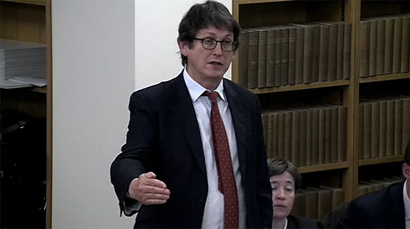 In March last year, speaking at a debate on self-regulation in the House of Lords, Rusbridger suggested the PCC might be “flying the wrong flag [and might be] better to rebrand itself as a media complaints and conciliation service and forget about regulation”. But he argued last night that self-regulation remains preferable to statutory regulation, and called for the PCC to take a tougher stance on issues such as phone hacking. He asked why it hadn’t written directly to News International over Glenn Mulcaire, the private investigator at the heart of the phone-hacking scandal, to ask “why are you paying fees of someone likely to be involved in illegal activity?”. The PCC, he said, needed to “do something which showed a vertabrae”. I can’t imagine a fine than would scare News International, they’re just so big and rich. What scares them is the truth, they’re are scared of the truth coming out. I put it to Rusbridger after the lecture that one of the things required to strengthen the regulator and allow it to undertake proper investigations would be better funding, and asked if, alongside his criticism of the body and calls for it to be improved, the Guardian should lead the way in making a greater financial contribution. It’s difficult, it’s not lavishly funded and it’s clearly not set up to do something like a big investigation into phone hacking. I think if we want the kind of PCC that’s going to be effective we are all going to have to pay more. But that’s a pretty tough message if you work on the Yorkshire Post or the East Anglian Daily Times. Why should you pay more when by and large you’re not doing things that are going to require fantastically expensive investigation? He acknowledged that the PCC did not have the funds to undertake thorough investigations, investigations “with teeth”, and said the press would have “to be a bit more creative about the way that we fund the PCC”. It can’t just stagger on as it is, being completely ineffective because they shrug they’re shoulders and say ‘we haven’t got the power and we haven’t got the money’. 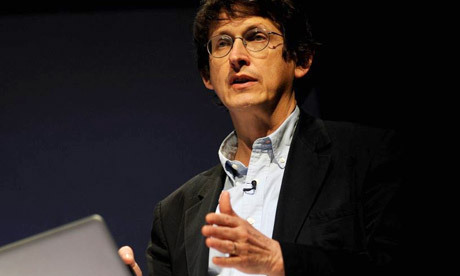 See Rusbridger’s full lecture at this link. This entry was posted in Events, Journalism, Newspapers, Politics, Press freedom and ethics and tagged Alan Rusbridger, News International, PCC, Press Complaints Commission, self-regulation, The Guardian on May 11, 2011 by Joel Gunter. Guardian media and technology editor Dan Sabbagh reports this afternoon that reporters’ and newspapers’ Twitter feeds are expected to brought under the regulation of the Press Complaints Commission later this year. According to Sabbagh’s report, Twitter accounts that include the names of publications and are clearly “official” – he cites @telegraphnews and @thesun_bizarre as examples – are likely to come under regulation, but reporters’ individual work accounts could also be brought under the commissions’ ambit. The PCC believes that some postings on Twitter are, in effect part of a “newspaper’s editorial product”, writings that its code of practice would otherwise cover if the same text appeared in print or on a newspaper website. A change in the code would circumvent a loophole that – in theory – means that there is no form of redress via the PCC if somebody wanted to complain about an alleged inaccuracy in a statement that was tweeted. Last year the PCC found it was unable to rule in a complaint made against tweets published by the Brighton Argus. Full post on MediaGuardian at this link. This entry was posted in Editors' pick, Online Journalism, Press freedom and ethics, Social media and blogging and tagged Dan Sabbagh, PCC, Press Complaints Commission, social networking, Twitter on May 6, 2011 by Joel Gunter.